Of Costa Rica’s half a dozen volcanoes, Volcan Poás is the most visited and among the most active. In the past 200 years Poás has erupted lava 39 times. It is only 40 kilometers (a two hour drive) from San Jose; the most easily accessible volcano. Poás’summit is 8,900 feet (2,708 meters) above sea level, on the frost line, so freezing temperature are common. Strong winds and high humidity are almost constant. It is above the clouds, and most months the summit gets more than 10 inches of rain. The crater rim is 160 feet (50 meters) below the summit, almost one mile across (1.6 kilometers) and 1,050 feet deep (320 meters). At the bottom a green bubbling sulfuric lake hisses and sprays almost to the crater rim. These are among the highest geysers on earth, spouting up 590 feet, when water contacts molten lava on the lake’s bottom. The lake has generated acid fog that stunted the surrounding vegetation. This lake is called Laguna Caliente. 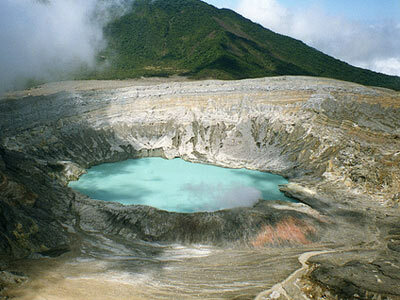 A second crater lake on the slope of the volcano is called Laguna Botos. Though very acidic it has no geyser activity here. Established in 1971 the Parque Nacional Volcán Poás, covers 13,800 acres. In addition to the 0.3 mile paved trail to the volcano rim there is the 0.9 mile Botos trail to the second lake, and 0.6 mile Escalonia Trail into the cloud forest. A visitor’s center with theatre and a small museum exhibits the volcano’s features and Costa Rica’s natural history. There is also a cafeteria and gift shop. Admission to Parque Nacional Volcán Poás is $10 U.S. Tours from Alajuela or San Jose are easily arranged at any hotel for $60 – $80, including admission. My tour from Alajuela included a min-van ride from my hotel, stops at sights in Alajuela, restaurant stops in the rich agricultural area below the volcano. Fresh strawberry smoothies were included, and later a locally grown lunch. Being above the clouds has its drawbacks. On my tour the view from the rim was obscured by thick white fog. The hike to the crater rim was a bracing experience: buffeted by winds and splattered with rain in contrast to the tropical warmth at the valley’s bottom. Luckily Emmanuel our tour guide provided everyone with rain gear. Peering into the clouds optimistically our Emmanuel said it still might clear up. However after half an hour it still held fast. He said on a clear day we could see not only the crater and geyser but also both oceans. The experience was not a complete loss; on the trails around the rim the Poor Man’s Umbrellas and other unique plants stood out vividly against the blank canvas of cloud cover. A rainbow of mountain flowers bloomed on the rocky slopes. Emmanuel salvaged the day by taking us to Escalonia Trail where we saw rare pyramid shaped Escalonia Trees as well as hummingbirds and the elusive Poás Squirrel. A visit to Poas can be arranged as part of most Costa Rica tours. Contact a travel agent such as this specialist in Costa Rica vacation packages to book your trip. Andrew Kolasinski, the author of the “Costa Rica`s Poas Volcano National Park” has recently moved to Costa Rica and reports regularly from the country with travel reports across the travel media, on-line and offline.